I love taking a moment. Taking a moment means you sit by yourself in some quiet spot. You take a deep breath. You sip some cool water. You let your mind wander for a few minutes. You pray. You close your eyes and cast your cares on the Lord. In the moment–whether you can afford just a minute (maybe two) or a full 10 minutes–you think about what’s causing any stress or irritation. You talk to God about it. You recalibrate your heart. You rid yourself of any entanglements. You confess sin. You just breathe in and out. You ask the Holy Spirit to control and direct everything once again. Then you get up. You move to the next important thing. You’re refreshed and calm. I love teaching students to observe their ordinary world and make meaning from it. Our final class essay involves noticing something that creates mystery, wonder, awe, even worship, in our regular routines. It’s a way to stop and think, to puzzle over something, to wonder. I’ve read essays about coats, hair, purses, and jellyfish. I’ve read about surfboards, tattoos, avocados, and cooking. Each observation must move through a series of questions to arrive at some kind of epiphany regarding this object or activity. Maybe it’s gazing wistfully at olive oil sent from Italy or shedding a tear over a rusting playground swing set. Students ask what ordinary objects symbolize to them if they truly stop and consider them. We read the essay to observe their mind at work, to see them grappling with ideas, to witness the invitation to epiphany. Why do I love this thing? Why does this thing always enter into my daily rituals? What happens if I lose this thing? What does it remind me of? Why does it create nostalgia? What is nostalgia? Is everything, really, about nostalgia–about the longing for some lost thing? We wonder. We gaze. We make meaning. My worst fears come upon me as I travel down the harrowing stretch of mountain road on the way home from a speaking event. The sky will darken soon. The cold rain pelts down. The cars travel too fast all around me. I glance down to check my speed. I notice it then: a warning light comes on. Again. This seems to always happen to me. It’s Satan’s best strategy against me: car trouble when I’m alone, far from home, and traveling on dangerous roads. It’s a rental car, and I pull over to discover the warning light means I’ve lost air pressure in one tire. After crying to my husband on the phone, I make my way to a gas station and ask a complete stranger–a white haired man who might actually have been an angel–to help me put air in my tire. The freezing rain pelts us both as we stand there fixing my tire. And I’m scared. I’m tired. I’m cold. I’m at the end of my rope. And I’m worried I’m going to get a flat tire and go careening off the side of the mountain. This very real possibility (at least in my anxiety-ridden mind) means I’m traveling with likely death facing me. I return to the road, and the warning light does not dim. I drive on and consider my options: I’m an hour from home. The car drives fine; in fact, I’m beginning to wonder if the light isn’t actually real, just some malfunction, some scare tactic that doesn’t represent any reality at all. Is the tire losing air? It doesn’t feel like it. Am I OK? Yes, here I am. I’m breathing. I’m OK. I’m moving forward. Besides, there’s really nowhere to stop as I crest the mountain and descend into the valley that’s home. I travel slowly, carefully, and near the shoulder all the way home. The whole time, I’m praying about that warning light. The whole time, I’m telling the Lord that it seems wise to travel anyway, to keep moving, to set my sights on home. I realize warning lights will always come; I’m in a dangerous world–both physically and spiritually–but the difference is I’ve got God here. We travel in the midst of scare tactics and warning signs–some real, some imagined, some easy fixes, some immobilizing. It’s wise to pull over for a bit and check out the situation, to pause, to seek help, to pray. We read the manual to know if it’s a warning light that means stop immediately. But still, we’d find another way to get home. We’d keep moving somehow. The warning light then, changes how we travel (more carefully) but not if we travel. Sure, the enemy prowls. But last night, I decided to keep moving forward. And I made it home. Well, I’m learning to be gentle with myself–profoundly gentle–especially in the face of criticism or when disappointing others. A woman I just met told me that what she’s most learning in parenting is that “she’s not everything” (and she shouldn’t be everything) to her children. We talk about how her not being everything means that her children go to God as their source, not her. And then I see it clearly: God is the Source. Not me, never me. Go to Him. I will fail you! I’m not everything, but Jesus is. I make immediate applications to all my roles: I’m not everything as a teacher. I’m not everything as a mother, a wife, a public speaker, or someone who shares her experiences with Jesus. I’m not everything as a friend. (In fact, my friends know that I’m good at disappearing for long periods of time, that I can be self-focused, and that I like attention.) But the truth: I’m not meant to be everything. In fact, it’s good when I fall short of your expectations in any area. It’s because I’m not everything. Praise God, I’m not. And you’re not. We’re just ordinary people serving an extraordinary God. It’s so precious to live in the humble and honest reality that we mostly screw up, that we mostly live lives of radical faith because we are at the end of ourselves, and that most of our problems come when we’re held to a high standard. And then I think about how I hold others to high standards, too. I don’t want to hold others to a standard only God can meet. And I’m learning to be gracious with myself when others hold me to standards I cannot possibly meet. We’re not everything because God is. He is Everything so I don’t have to be. Today, I rejoice because I feel like God’s treasured possession. I know I am, but I don’t always feel like I am (and I certainly don’t wake up feeling treasured by God all the time). I woke up fully rested–a miracle at my age. Thank you, Lord. Thank you! Secondly, I went to gather my rental car for a speaking event I’m driving to, and the car they want to give me is a brand new Volkswagen Jetta. I’ve always wanted to drive one, and here I am. Oh, Lord, thank you for something so extravagant. The sun is shining. Thank you, Lord. I have a ripe avocado to eat. Thank you, Lord for creating avocados. I’m driving into the woods later to speak at a retreat in the countryside. Thank you, Lord, for streams and forests and creatures like turtles and red foxes. Before setting out, I finish reading a manuscript for a friend whose words delight me. Thank you, Lord for the gift of writing and for inviting us into the wonder of storytelling and communication. What a joy! Then, I compose a recommendation for a student to set her up well for her professional life. I’m thankful for my role as mentor and encourager. Thank you, Lord, that you might use me to help younger women succeed. I’ll drive down country roads, windows down and music blaring. I’ll sip my green tea and much on pecans. I’ll pray. I’ll be with Jesus the whole time. How thankful I am! I can read a room. I can read the mood of a room, in particular the students within a room, within the first few moments of their arrival to class. And this morning, our collective mood needed some lifting. But then? Compliments. The compliments began. She said, “Thank you. It’s new.” Beaming. She was beaming. “I’ll take that as a compliment,” I say. Compliments. What if you offered at least three genuine compliments today? Compliments bring positivity into the environment, bolster confidence, and help forge loving bonds. And compliments aren’t just for others; when you give a compliment, it keeps you positive and joyful. Compliment-givers read the environment a certain way. They look for what’s beautiful, good, hopeful, and true. They name what they see in order to show kindness and love in an otherwise critical and despondent environment. 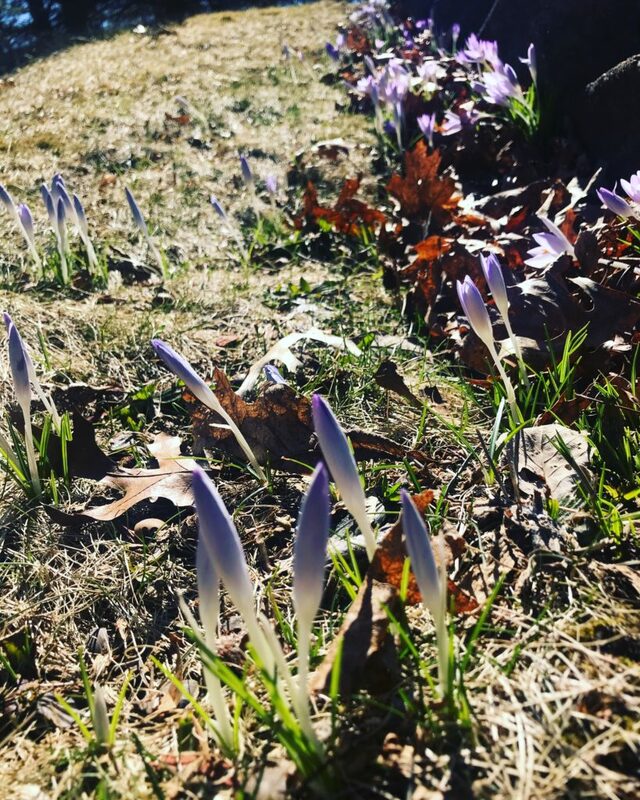 On the chilly walk, I stoop down to observe the persistent and powerful crocus. Two things: the purple astonishes me every spring, and the fact that they emerge through snow and freezing temperatures challenges my whining over my circumstances. The crocus sings. The crocus pushes up through snow, piles of decaying leaves, and empty landscapes to announce a reality that’s coming that we cannot yet see. Spring is here. I bring it within me. Don’t worry. If I’m here, Spring is too. The crocus means hope. It means the sure arrival, like clockwork, of blessing despite any circumstance. The crocus tells me I will learn to worship, to push up toward the light, year after year, year after year, because it’s the way of things. It’s how life works: one day, you’re in winter’s clutches. The next, you’re victorious and a display of God’s nature. I also think of the Holy Spirit within me. I bring Him with me. If I’m here, so is God. It doesn’t matter what Winter says. I bring Spring. I love a fresh, new month. Let’s make it wonderful! Think about setting goals, committing ourselves to an attitude of thankfulness and rejoicing, and increasing our faith to trust God in ever-expanding ways. What goals shall we set? What might we thank God for right now? What areas of our life require more and more faith?